So I finally was able to do it!!! 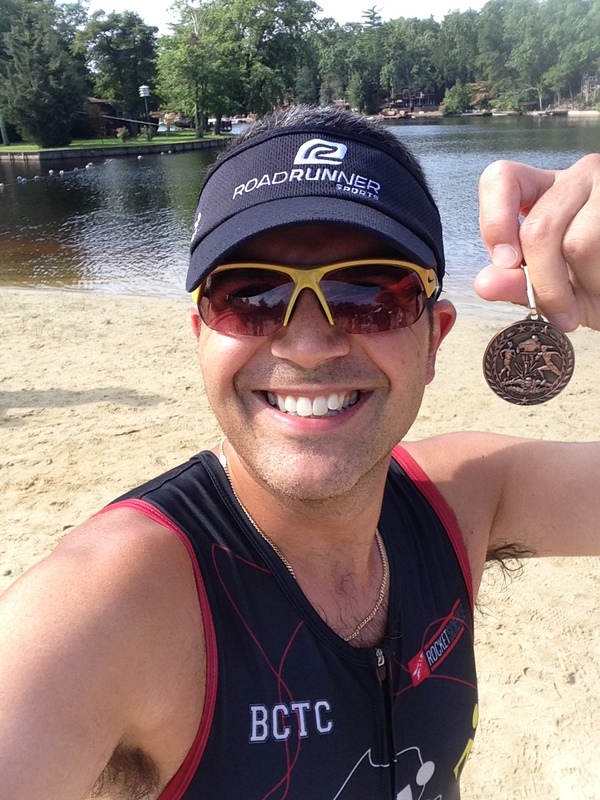 I am a triathlete!!! 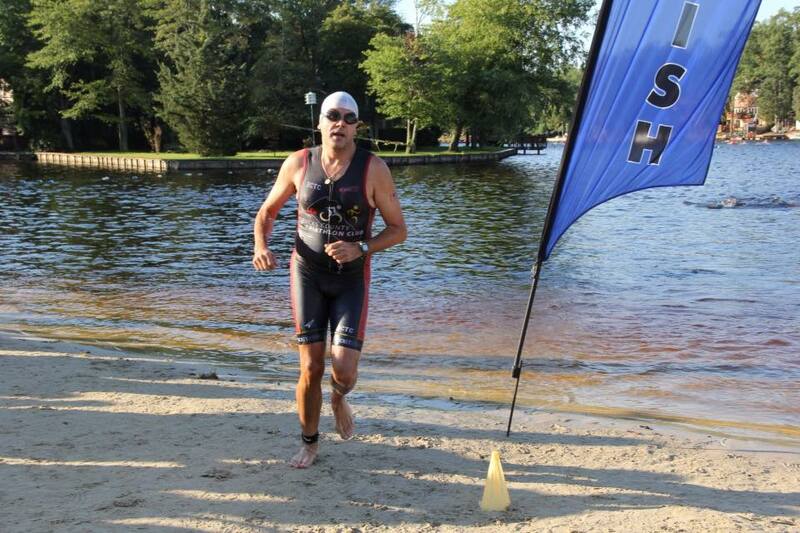 On August 23rd I completed the Medford Lakes Colony Sprint Triathlon. 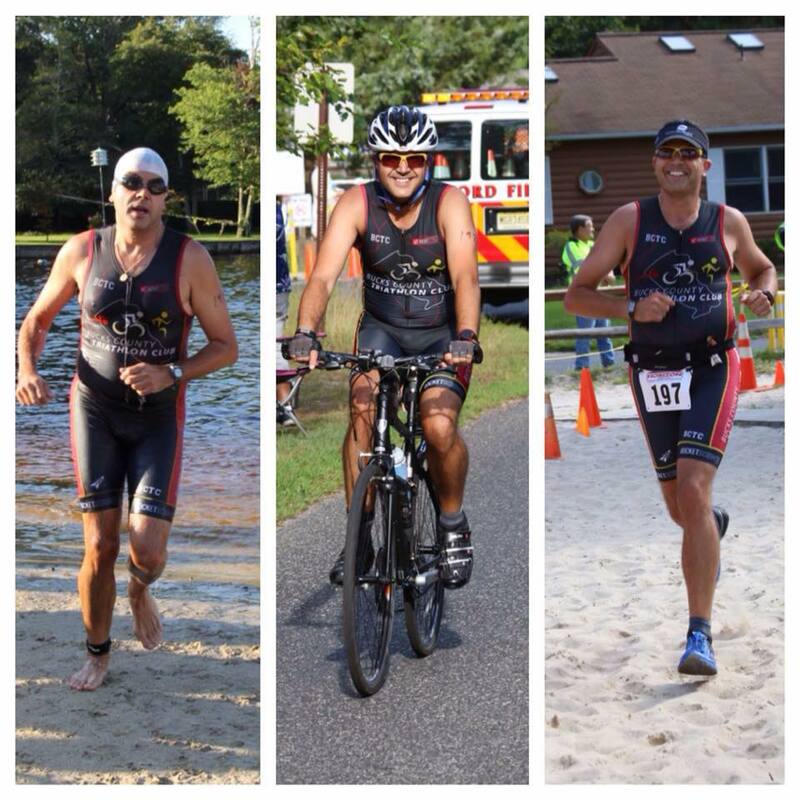 This was my make up race after what happened last month during the New Jersey State Triathlon (which was cancelled mid-race). After the disappointment of last month’s attempt at my first triathlon I was looking for a local(ish) sprint distance triathlon while still being able to swim in warmish water (not requiring me to hire a wetsuit) and while I was still in the mindset to get this done. 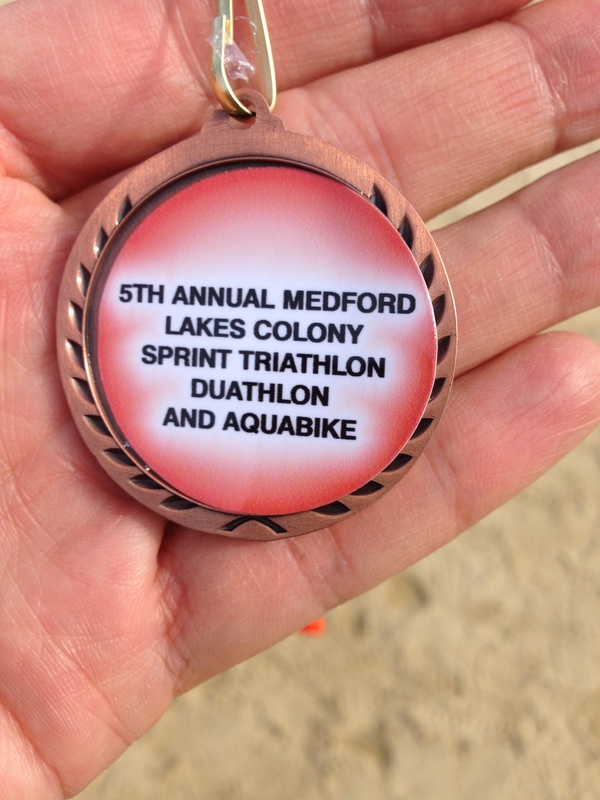 Medford Lakes Colony Sprint Triathlon fit the bill. It was about an hour from home and I had the benefit that my wife was able to pick up my race packet on her way home from work (she works about 10 minutes from Medford, NJ). The race was managed by DQ events who I have raced some of their events before. No frills but good organization. They know how to stage a race. Actually, I knew going in that I was probably going to finish. I had already completed three duathlons so the bike to run change wouldn’t be too hard and I was able to finish the swim to bike part which was my biggest fear before the first attempt was cut short. So I just had to piece all three parts together. 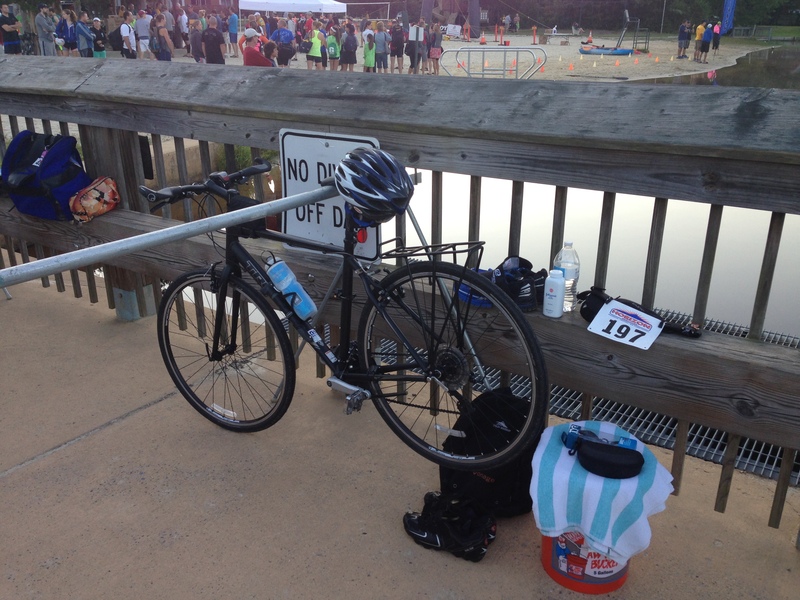 After having experienced at least the pre-race portion and the transition area of a triathlon I took note of what I had seen and decided to pack my gear in a simliar manner. 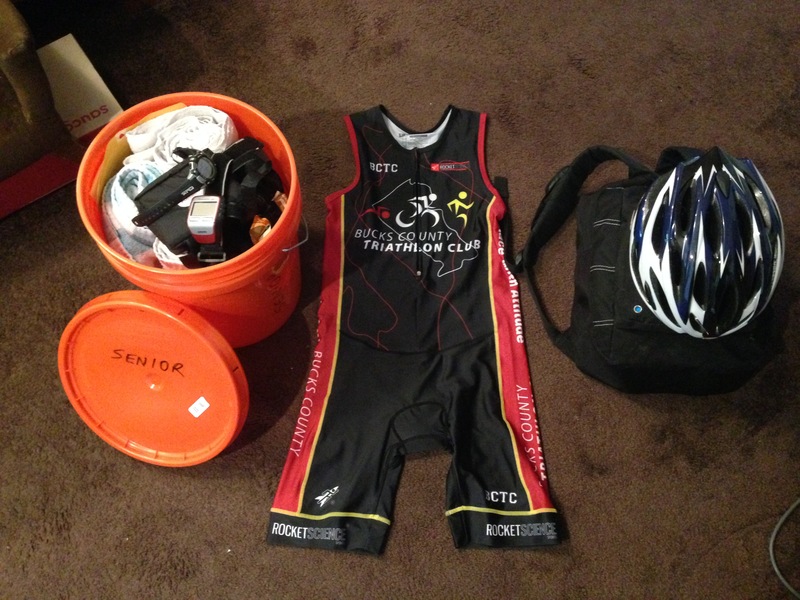 During my last race I had seen people walking to the transition area carrying their gear in a 5 gallon bucket. I just thought that was their way of bringing in all their stuff easier. A colleague of mine noticed that those people used those buckets as a seat during the transition. Genius!! 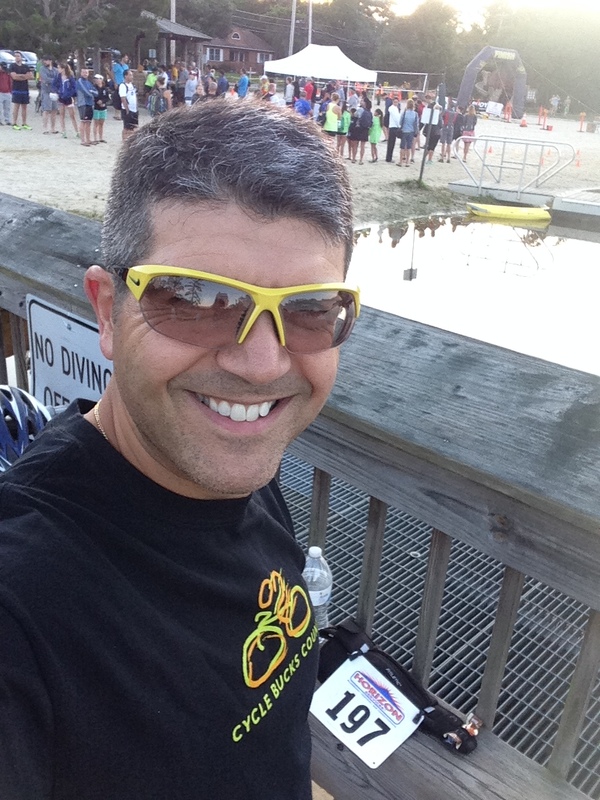 I had sat down during the New Jerset Triathlon between the swim and bike and had probably wasted time a little struggling to get dry and clean and dressed…mind you that may have been my choice to wear Injinji socks which aren’t the easist to put on in a hurry. I packed my car early and set up my bike (no burst tubes this time) and set off for Medford, New Jersey. As I got closer I just blended in with all the cars with bikes attached and followed them into the parking lot. A nice easy ride. It was fairly early and actually quite chilly. I’m glad I had an outer layer on when I arrived. As it happened I saw a line of people line up on the beach in front of the lake. I racked my bike (without realizing it I was almost at the very back of the transition area) and stood in line. Thankfully I was quick enough to ask what the line was. I had assumed that it was to get marked up with my race number. In fact it was race day packet pickup. Although it moved fast I was able to jump out of line, get my race numbers drawn on my arms and leg and get back to setting up my gear while many folks were still in line. I set up near the side of the bridge which actually provided a little extra room to store my gear. I then set off for a quick port-a-pottie stop. 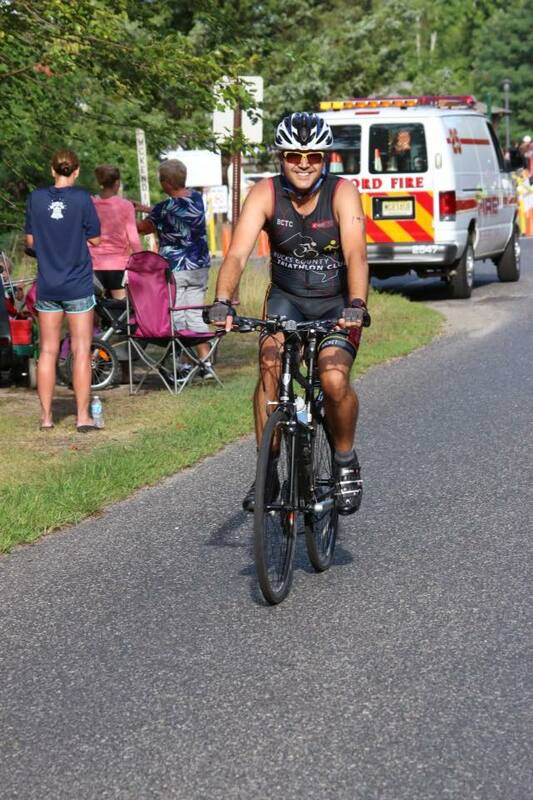 At this point I had stripped off my t-shirt and warm up gear so that I was only wearing my tri-suit and really felt a chill. The sun wasn’t quite up yet so it was still a little cool in the air. 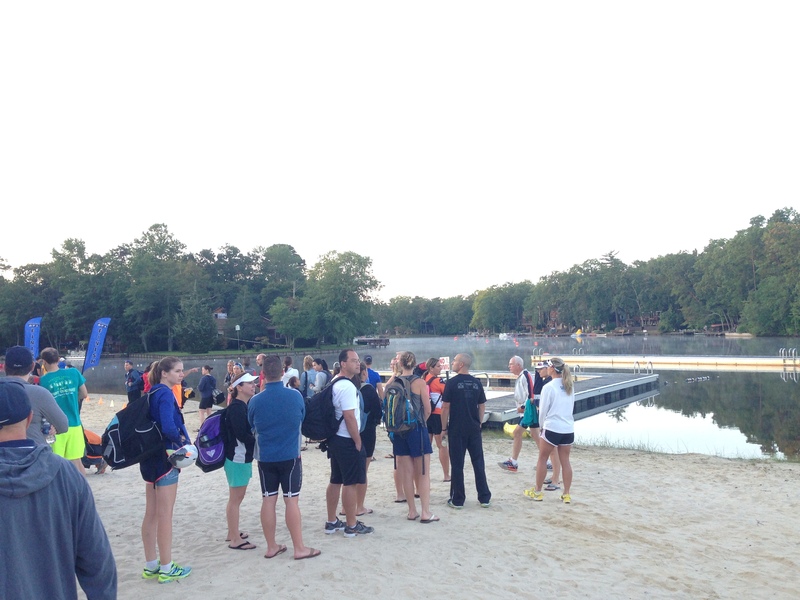 I took the time to walk around the beach and get acquainted with the start area. View from the bridge. All is calm. I took a few steps into the lake and was pleased to discover how warm it was. 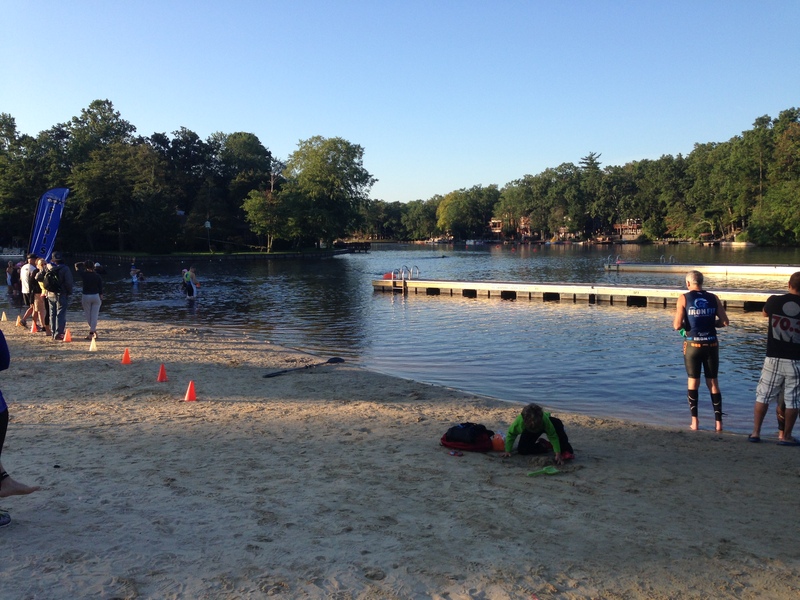 I had seen plenty of folks putting on wet suits and indeed the chill in the air had me a little nervous about the swim conditions but a few steps in I could feel the reassuring temperature of the water and relaxed a little. Just before the start of the race the race director gave final announcements and instructions to the racers. 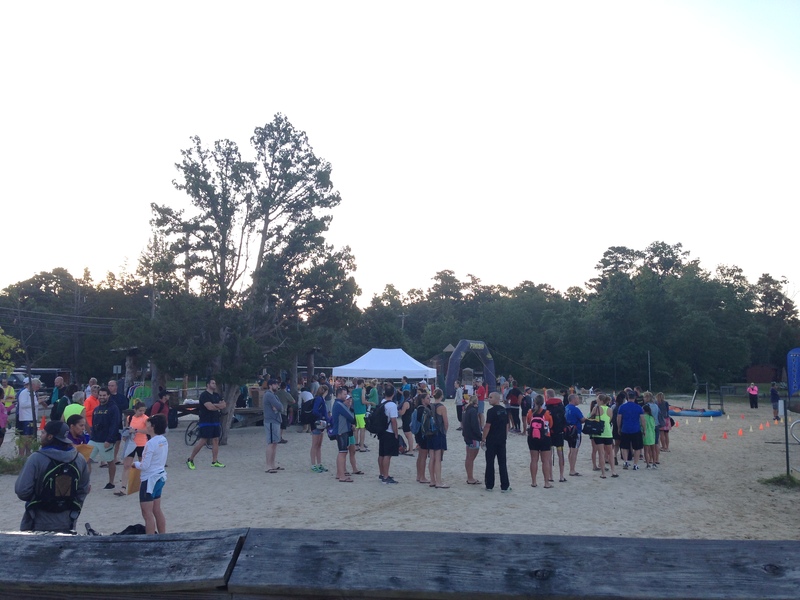 There were in fact a few different events going on in addition to the triathlon. 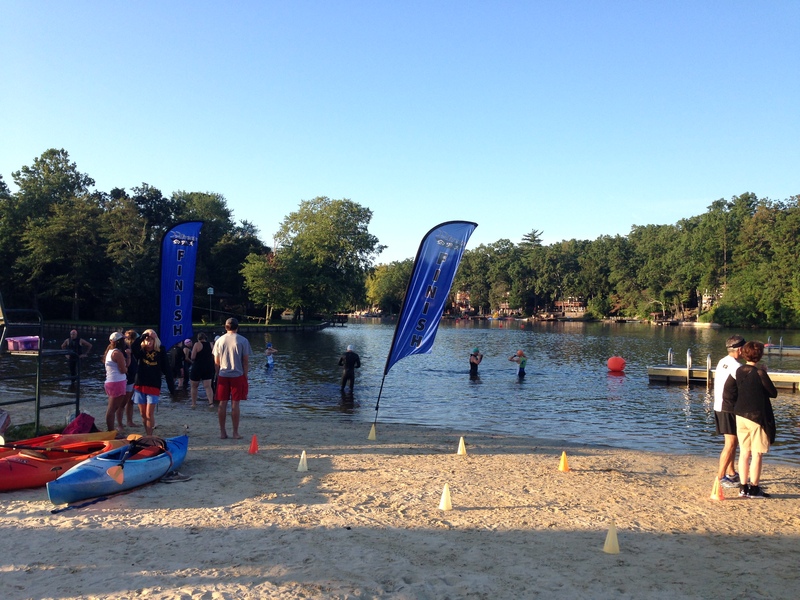 There was a duathlon (run/bike/run), an aquabike (swim/bike) and a triathlon relay (teams sharing in one or more of the events). We were instructed to come up the beach and walk through the finish line as it had a timing mat and would trigger our chips that the race had started. Unlike the New Jersey Triathlon where the numbers of racers was so large and I was in the 8th swim wave, this was much smaller and I started in the 1st wave. As before I waited for the word to go, counted to 10 and then set off. I’m not looking to set records or gain a podium place, just to finish. I set off into the warm water and was doing okay. I’ve learned NOT to drink the water this time but I still need to work on my sighting. I say that only because I saw so far to the left of the course that I bumped into the pier. Oops. I made it to the turn and headed back in. As I was on the return leg the lead swimmers from the next wave started to pass me. I didn’t say I was fast but I was still swimming. I finished the swim in just over 13 minutes. 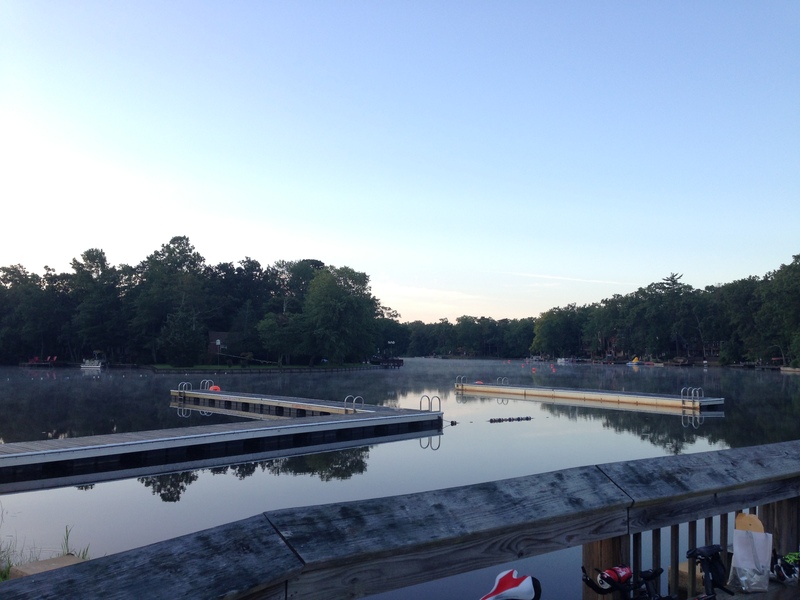 A little quick than my previous open water swim, I drank less and didn’t feel dizzy running out of the water. I’d call that a win. 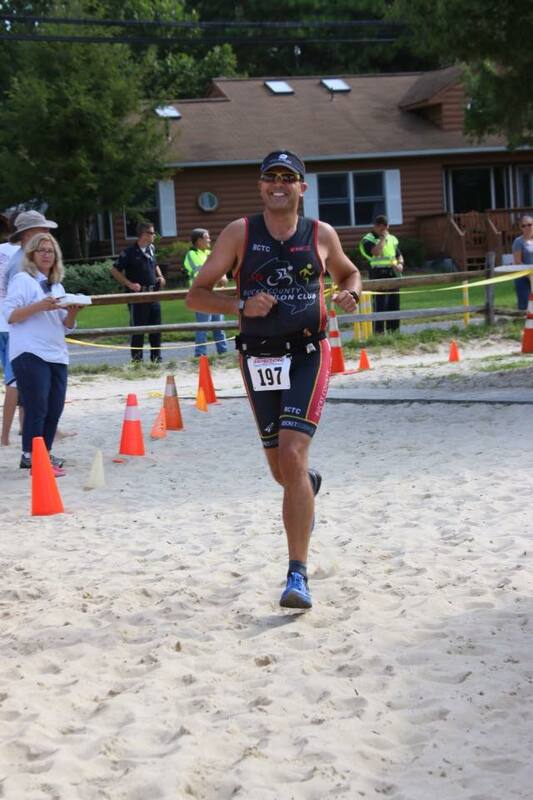 I race over the beach to the transition area. Whipped out my bucket seat and set about rinsing and drying my feet, applying some talcum powder and wiggling my toes into the Injinji socks. It was then that I realized I had set my bike up at the back of the bike corral. It was a long walk/jog with the bike to get to the point where I could mount the bike and set off for the 17 mile bike course. The bike course was an 8.5 mile loop which we rode twice. It was here that, while I didn’t struggle, I was at a disadvantage. I was going at what I thought was a pretty good clip on the bike but everyone else seemed to have road bikes and just whizzed past. I didn’t dare turn around as I thought there would be noone behind me. If anything, the bike portion of the race lost me time even though I thought I was going flat out at points. Oh well. Not having a race bike isn’t a barrier to entry for a triathlon, it still allows you to compete, but it shows you for sure that this might not be the cheapest sport to enter (even without the additional cost to buy or rent a wetsuit added to that). I felt pretty alone on the second lap of the course…I mean really alone. I’m sure I wasn’t the last person to finish the bike course but I sure wasn’t near the front!! Once the bike course was complete I again had the long jog/run to the other end of the bike transition area. I changed into my running shoes and set off for the 5K. 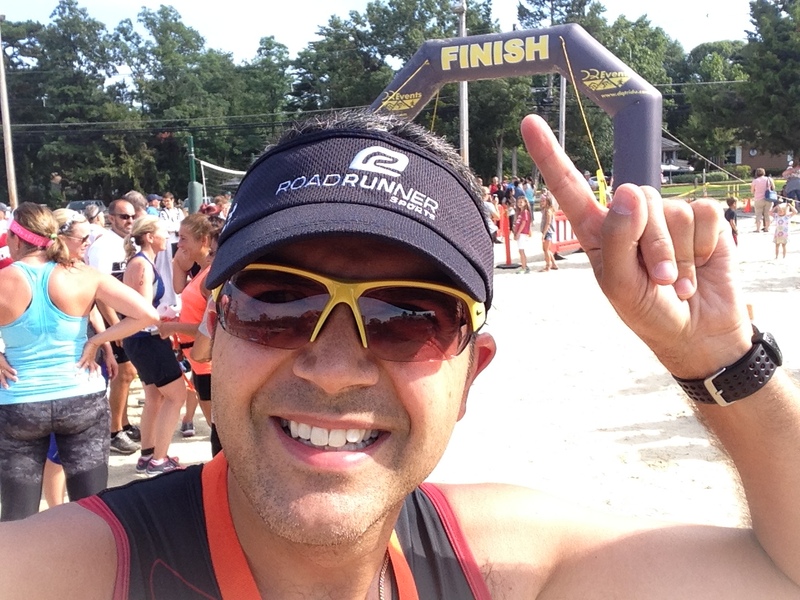 At this point, this was the furthest I had ever been in a triathlon…WINNING!!! It was pretty hot by this time and I had added a water bottle to my race belt. 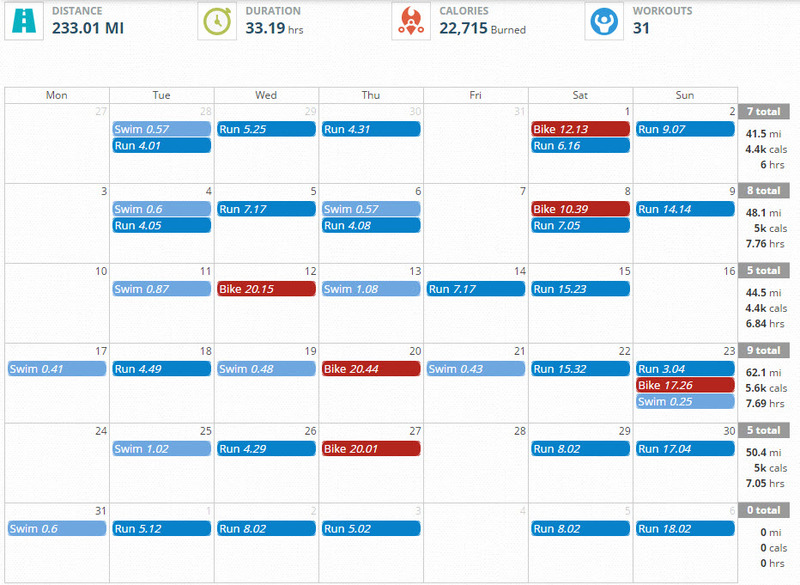 I decided that my legs felt good enough to just run the 5K distance and didn’t go with my usual run/walk/run that I use for all training runs. I just set off for the last leg and ran. It was at this point that I made up a few places that I had lost on the bike. I wasn’t setting a PR but I had enough left in my legs to run a decent pace. I passed a number of people and felt good at the turnaround. 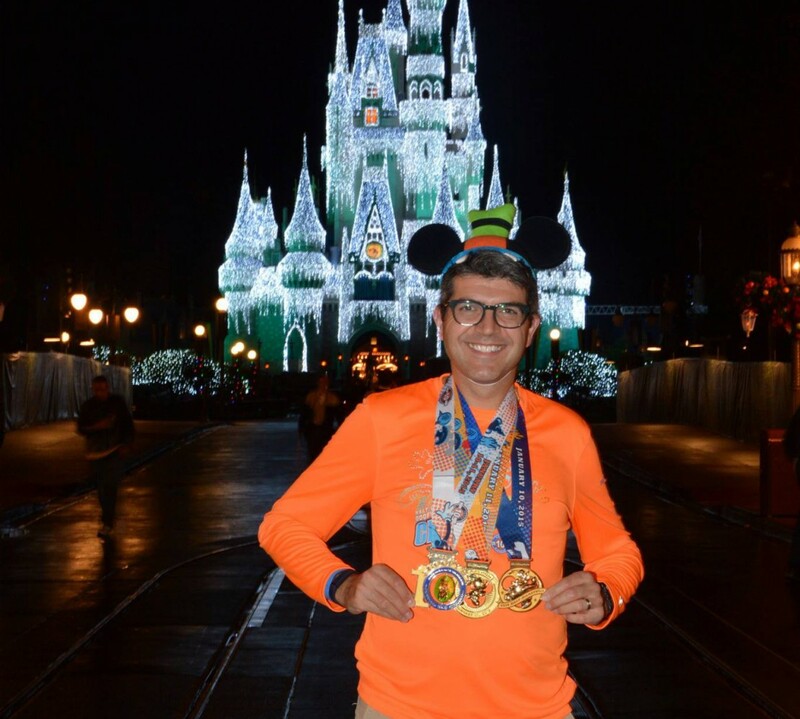 Once I headed back and knew I was in the last half a mile I picked up the pace and headed for the finish. 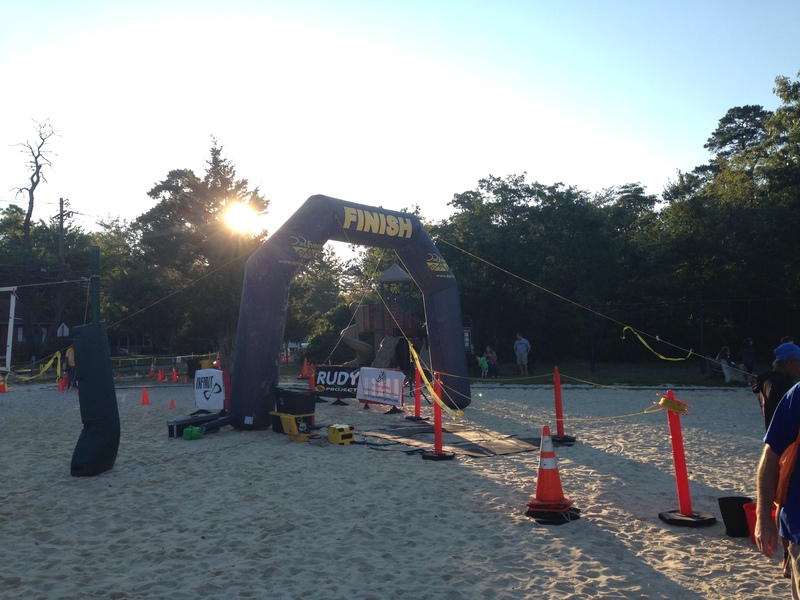 The finish line was on the beach and those final few steps were alot of fun. The course came up short on my GPS which is kind of strange because I’m usually a little long due to me not running the tangents but I didn’t care. 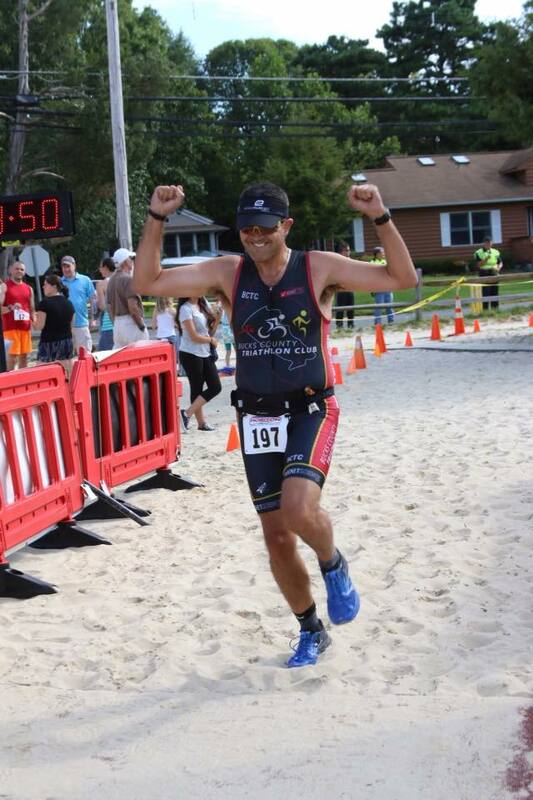 I wasn’t anywhere near placing in my age group but raised my hands high as I crossed the finish line. 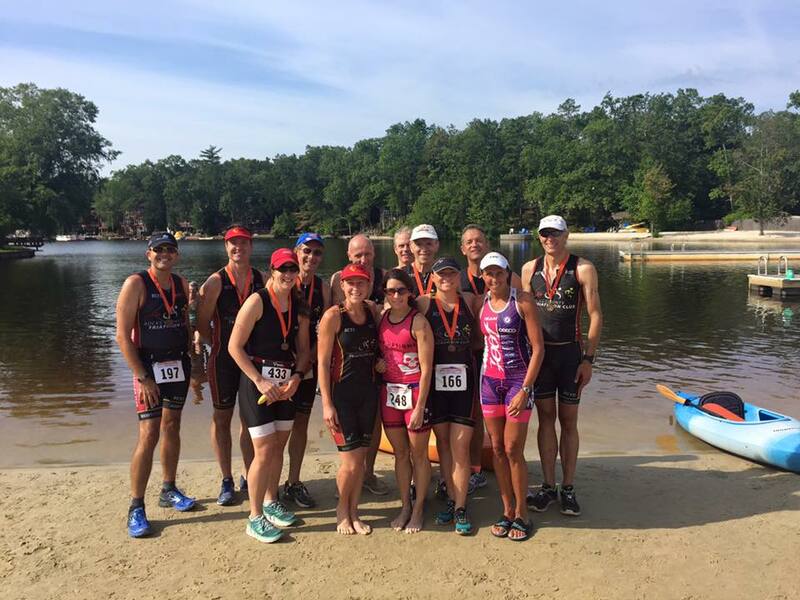 After finishing the race and getting my breath back I met up with other members of the Bucks County Triathlon Club for a team photo. Our group included a number of place finishers. 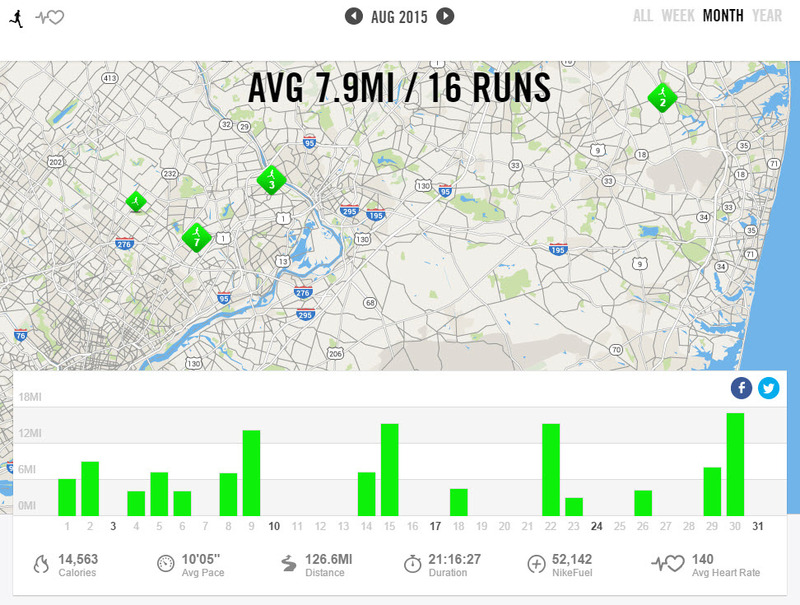 I have a long way to go but I had a lot of fun. So, finally I’m a triathlete. I think the best thing is that I have overcome my fear of the swim. 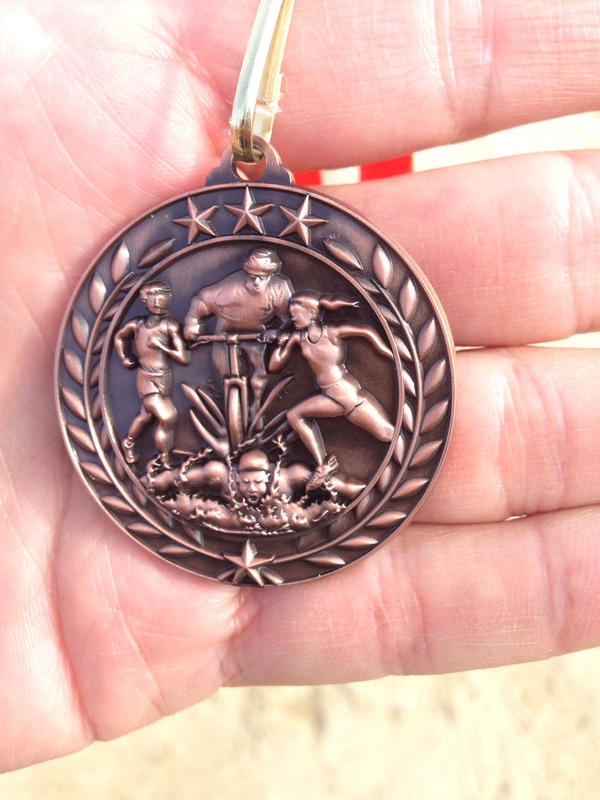 Although I can do way better in that area, that was a big fear when I signed up for a triathlon. I have worked on the swim for a few months now and I can definitely see progress. 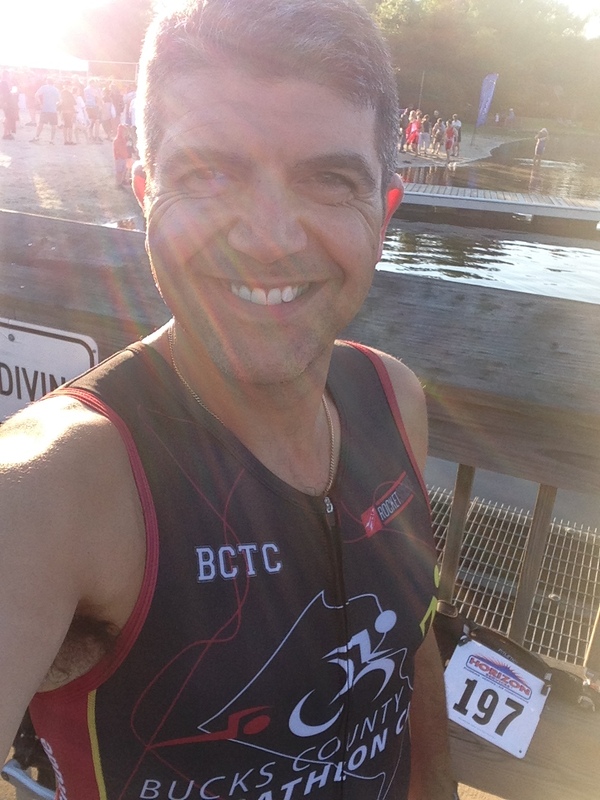 I have my sights set on some triathlons next year but while I was still in the mood (riding the high) I signed up for what will be my last triathlon of the season, the Hightstown Triathlon in mid-September. That was my back up race in case for some reason this didn’t work out. There are a number of people from my office who are taking part so it’s also a draw for me to enter. Looking forward to that.